Nowadays, we can see the increasing numbers of threats that focus on mobile devices, especially Smartphones and tablet PCs. Because of this, it has become necessary to take some dedicated effort to enhance security of your Smartphone. Obviously, the best method is to get an effective mobile security app, given that you pick the right one. In the list, however, we can definitely spot Bitdefender Mobile Security. To help you choose with confidence, we shall have an in-detail review of Bitdefender Mobile Security and some cool Bitdefender Mobile Security coupon codes. 25% Off Bitdefender Mobile Security 2016. Pay Just $11.21. Verified 10 Hours Ago. Hot Deal. We hope you know about the free version of Bitdefender Mobile Security, which you can get for your Android and iOS. If you think the offered features are not enough, you should opt in for Bitdefender Mobile Security Premium. The pricing of this security suite is extremely simple. 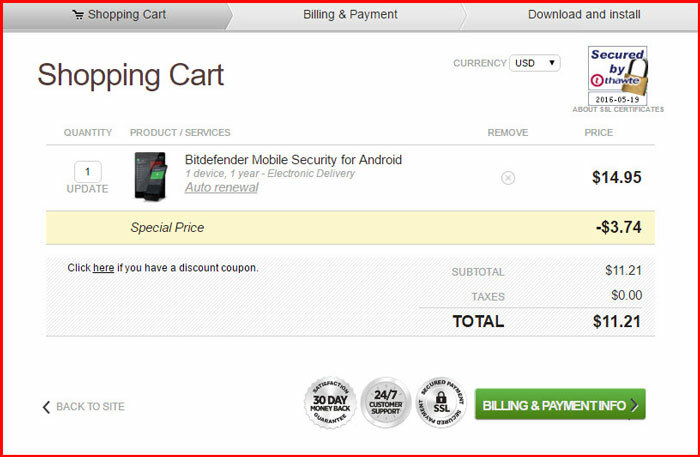 You can buy Bitdefender Mobile Security for just $14.95 and 25% discount so final pricing will be $11.21, if you use Bitdefender discount link given above—as simple as that. It does not have any kind of hidden charges; and you can purchase the app right away from Google Play Store. It does have auto-renewal feature when you get it from official site. By the way, if you have purchased any bundled pack of Bitdefender antivirus — Bitdefender Family Pack, for instance —, it’s possible to have this app for free. Plus, in that case, you get all the benefits of Bitdefender Central. But, if you get the app from official website of Bitdefender, you can use some Bitdefender Mobile Security coupon codes to avail a nice discount. We hope you know pretty much about Bitdefender. That is one of the reasons why you go with Bitdefender Mobile Security even when other security suites are there. So, let’s not talk much about the company. Just keep in mind that you can completely trust Bitdefender Mobile Security in terms of protection algorithms. You can also make sure that Mobile Security app will work seamlessly with other Bitdefender software, giving seamless protection in all devices. Talking of Bitdefender Mobile Security, it’s an all-in-one security app for Android Smartphones, iOS devices and tablet PCs. If you have used Bitdefender antivirus in other platforms like Windows, you might be familiar with some features. There is Bitdefender Autopilot, for instance. This feature is useful when you don’t have time to take security-based decisions. In those cases, you can let the antivirus app to think and decide. Along with it, there’s Web Filtering and the GPN — cloud-powered Global Protection Network — that make antivirus protection quite effective. Bitdefender Mobile Security also combines the features of Bitdefender Clueful, which lets you know what installed apps are doing in the backstage of device. In short, once you have finished the installation process, Bitdefender Mobile Security will get you the best-in-class protection for different aspects of Android device. Privacy Advisor feature of Bitdefender Mobile Security protects your privacy from threats. There are chances that some of the installed apps will be intervening to your privacy and data. Using this feature, you can have an in-detail analysis of apps you have installed. Based on the scores and suggestions you get, you can decide to keep them or not. Bitdefender Anti-Theft gives you remote access to your Smartphone when it’s stolen. You can use the web-based dashboard to locate your device and get it. In case if you don’t get that back, you can wipe the phone or delete the data at the maximum. You can also get a mugshot of the stranger if someone uses your device when you are absent. App Lock feature of Bitdefender Mobile Security is useful when it comes to restricting access to others. With the simple interface, you can lock specific applications with a pass-code or something. So, next time when a stranger asks you the phone, you can give it to him with confidence. It also has options for disabling the lock when you’re connected to selected networks. Other features of Bitdefender Mobile Security include the in-built support for Android Wear devices. You can use your Android smartwatch to locate the Smartphone if you don’t find it in your sight. Another thing to be noted about Bitdefender Mobile Security is that there’s no performance impact. Despite all such features mentioned above, your Smartphone will have 100% speed. You get protection and speed, at once, for sure. In light of what we have said above, Bitdefender Mobile Security is an affordable, easy-to-use and feature-rich app to protect your device. The availability of Bitdefender Mobile Security promo codes is useful, as it can cut down your budget to optimal Smartphone security. In addition, it needs to be noted that the features are quite practical. Its App Lock feature and the Anti-Theft feature are sense-making for almost all users out there. So, for the price you pay, it’s offering the best security for your devices. If you have any plans to buy Bitdefender for your computer or Mac use our deals for Bitdefender and read comparison of Bitdefender products.